ePublishing Knowledge BaseePublishing Knowledge BaseePublishing Knowledge Base EditorialHow do I edit an existing editorial content block? Editorial content areas are used on your website for fixed content that can be edited. This content is usually just one part of a larger page. Frequently, for example, editorial content is used to allow for easy editing of sections of a right rail or on the front page. Or an editorial content area may allow you to edit introductory paragraphs on pages with forms that your customers might submit, such as classifieds. Some editorial content areas are for confirmation text after a customer purchases a product or submits a form. View the full list of default editorial content areas in the User Manual. This article will show you how to edit an existing editorial content area. If you have questions about how editing an existing editorial content area will affect your website, please contact your solutions manager. 1. 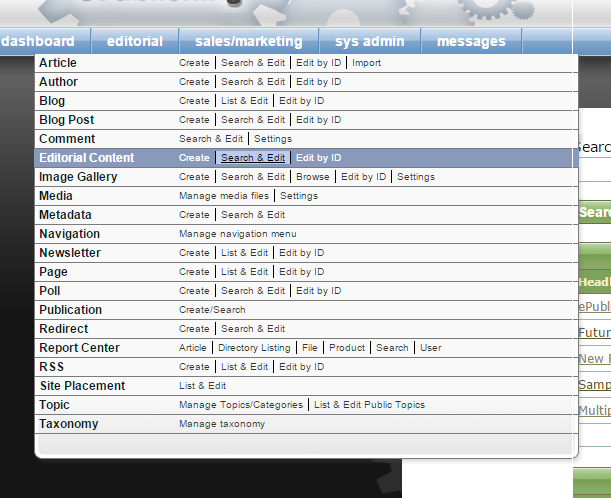 To access the Editorial Content Manager, click Search & Edit next to Editorial Content under Editorial in your dashboard. 2. 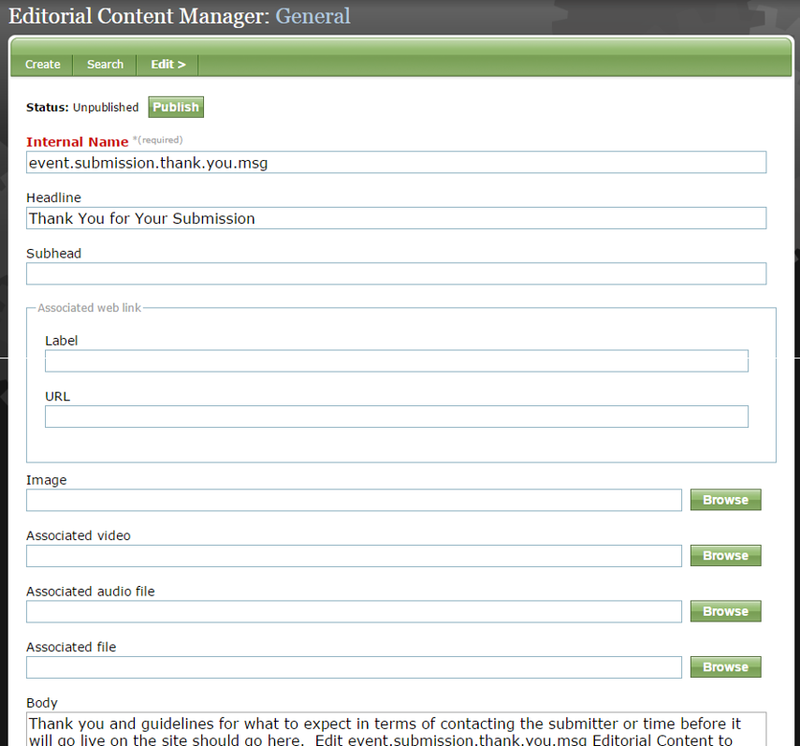 The Editorial Content Manager organizes your editorial content areas alphabetically. Zoom: The Editorial Content Manager organizes your editorial content areas alphabetically. The Internal Name (1, above) represents the name of the editorial content area on your website. This was set up by ePublishing. The Headline (2, above) may or may not be visible, depending on your website. In some cases, it may help you pinpoint which editorial content area you need to edit if the Internal Name is not clear. 2.1. For example, Shopping Cart - Bottom is the description of where the order.cart.msg editorial content area lives on your website. Zoom: For example, Shopping Cart - Bottom is the description of where the order.cart.msg editorial content area lives on your website. If you have any questions about where editorial content areas are on your website before editing, please contact your solutions manager. Not all editorial content areas are available to edit and each site will have its own site-specific editorial content areas. 3. Don't edit the Internal Name, but you may want to update the headline. Each editorial content area will be different. Zoom: Don't edit the Internal Name, but you may want to update the headline. Each editorial content area will be different. The headline may not be visible on your website; it depends on the editorial content and your individual website design specifications. 4. To edit the Body, scroll down and edit using HTML or in the WYSIWYG editor. Zoom: To edit the Body, scroll down and edit using HTML or in the WYSIWYG editor. * Do not change the Site Placement unless you are an advanced user of these tools or have spoken with your solutions manager first. In this case, for example, we are editing the thank you message after the submission of a new event. We do not want to alter where that message appears as this editorial content area is designed for a specific place on the website. 6. Be sure to save your work if you've made any changes. 7. 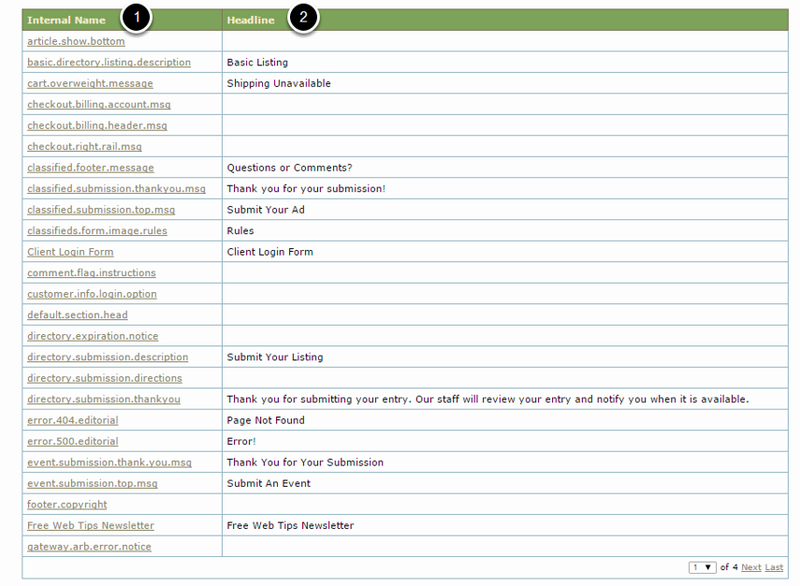 If the editorial content area you are editing is not published, click the green Publish button at the top of the page. Zoom: If the editorial content area you are editing is not published, click the green Publish button at the top of the page. Prev: How do I create a new author? Next: How do I delete an author?